The skin might appear pigmented where darker hair grows. Your kitty's skin color can shift over time, which is an inherited trait for some cats. The pigment change can happen all over or just in spots. However, changing skin color can also signify some serious health problems, so always get it checked out by your vet. If your kitty's skin has patches that are darker, sometimes significantly darker, than other areas, it might be normal for her. Some cats are born with blotchy skin, which is just an inherited trait. Her hair is usually darker where her skin is darker, although that's not always the case. However, if your cat's skin has always been a solid color and suddenly develops dark blotches, check with your vet immediately. This can be a sign of serious problems, such as skin cancer, tumors or immune disorders. As your cat grows, he might develop brown circles or small white blotches on his skin, particularly on and around his face. Although any change is worth mentioning to your vet, this is likely a benign skin change if it's not accompanied by other symptoms, such as scratching or loss of appetite. Lentigo affects orange cats and creates small circles of brown or black on the skin. Vitiligo is the loss of pigment, which means white spots appear. This can also change the hair color, turning it white over the affected areas. A sudden change in your kitty's skin color over her entire body is usually a symptom of a bigger problem that needs a vet's attention immediately. Cushing's disease, or too many corticosteroids in your cat's body, can cause darker skin, bruising and hair loss, or your feline friend's skin might seem thinner than normal. With hypothyroidism, your cat's skin might become darker or lighter, and her hair might seem brittle. A yellow tinge to your kitty's skin often reflects jaundice, which means something's not right with her liver function. Inflammation from long exposure to an allergen can also make the skin appear thicker and darker. If you notice one or two spots on your cat's skin that are darker or lighter than the rest of her, it could be something as simple as a bad reaction to a mosquito or flea bite. If there's a lump under the discoloration, your kitty can have a cyst -- which is unlikely to require treatment -- or a cancerous tumor. Your vet can biopsy the site to determine the problem. A dark spot could be just a bruise, although bruising in cats can signify blood platelet or hormone problems. If your cat recently had a shot or vaccination, the skin might appear dark and thick around the area, although this isn't normally a serious problem. Why is My Dog's Skin Turning Dark? Are Domestic Tiger Tabby Cats Color Blind? Can a Cat Have a Birthmark? What Color Are Most Cat Noses? 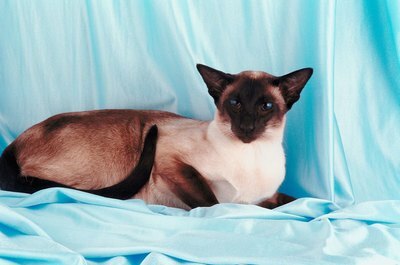 "Black, Scaly Patches With Hair Loss in Cats"
Are Cats Attracted to Colors?